The Artist, and thence to Sonia Delaunay, his widow. Madame Bourdon, Paris; her sale, Paris, Hôtel Drouot, 25 March 1990, lot 16, where purchased by the present owner. G. Vriesen and M. Imdahl, Robert Delaunay - Licht und Farbe, Cologne, 1967, no. 4 (illustrated). Habasque, Robert Delaunay, no. 27. M. Hoog, Delaunay, Paris, 1976 (illustrated p. 11). S. A. Buckberrough, Robert Delaunay: The Discovery of Simultaneity, Michigan, 1978, no. 8 (illustrated). D. Molinari, Robert et Sonia Delaunay, Paris, 1987, no. 21 (illustrated p. 17). E. Franz, Signac et la libération de la couleur, Münster and Paris, 1997 (illustrated fig. 1, p. 185). Salon d'automne, Paris, 1906, no. 420. Paris, Galerie Charpentier, Cent portraits d'hommes du XIVe siècle à nos jours, 1952, no. 19. Paris, Orangerie des Tuileries, Robert Delaunay, May-Aug. 1976, no. 6 (illustrated p. 38). Baden-Baden, Staatliche Kunsthalle, Robert Delaunay, Sept.-Nov. 1976, no. 6 (illustrated p. 90). Iowa City, The University of Iowa Museum of Art, Jean Metzinger in Retrospect, Aug.-Oct. 1985 (illustrated on frontispiece). Delaunay was already exhibiting his colourist paintings at the radical Salon des Artistes Indépendants in 1904. In 1905, when the Fauve painting of Matisse, Derain and Braque was arguably at its most explosive and experimental, Delaunay forged a strong friendship with Jean Metzinger who, at twenty-two, was two years his senior. As contemporary correspondence between the two young turks suggest, they had strong feelings about what represented good art. Both were fascinated by the innovative colour theories of Chevreul and Rood whom the Neo-Impressionists so admired. It was this combination of an interest in Fauvism and in contemporary scientific research into colour which inspired Delaunay to develop his own colourist abstractions later in his career. Inspired by the fact that Derain, Matisse and Vlaminck had painted celebrated portraits of each other (fig. 5), Delaunay and Metzinger began to work on a series of portraits of one another, many of which have sadly been lost. The present picture, and arguably the most important known of the series, was chosen by Delaunay for the famous Salon d'Automne exhibition of 1906 where the Fauve painters had such an extraordinary impact (fig. 4). They had arrived on the scene the previous year but in 1906 two of their leading lights - Vlaminck and Derain - exhibited startlingly radical paintings of Chatou and L'Estaque. 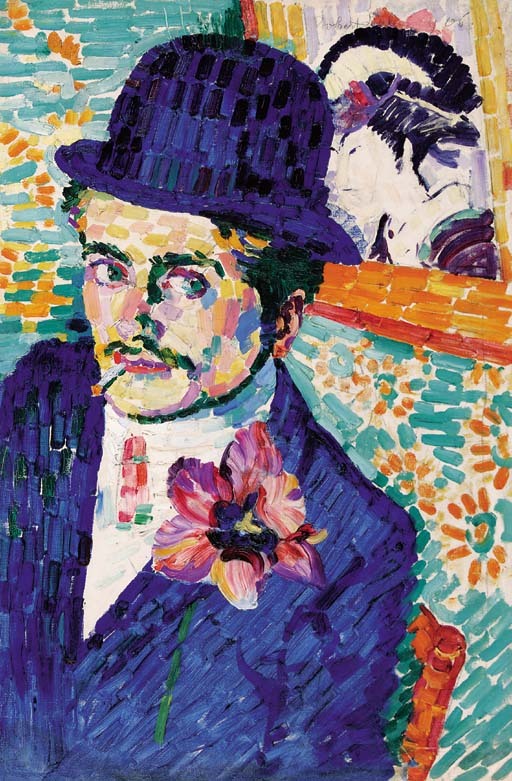 Delaunay exhibited the present painting as well as a portrait of Henri Carlier (Paris, Musée National d'Art Moderne, Centre Georges Pompidou). Metzinger, in turn, exhibited only two paintings; one was a landscape entitled Les Flamandes and the other was his celebrated portrait of Delaunay (fig. 2), the location of which is unknown today. In the exhibition the two works by Metzinger were given as being the property of Delaunay. The relationship between the two young artists was obviously extremely close. The present painting is also something of a hommage to Van Gogh. It was Van Gogh whom Delaunay and Metzinger considered to be the true father of colourism. In 1905 both young artists had exhibited eight oils at the 21st Salon des Artistes Indépendants. It was at this exhibition that forty-five major oils and works on paper by Van Gogh were shown a retrospective to the Parisian public for the first time. The impact that this exhibition must have had on young colourist painters would clearly have been considerable. Amongst the forty-five works were two pictures which Delaunay clearly looked at closely. First was Van Gogh's Portrait à l'estampe Japonaise (cat. no. 10) and second was his Portrait de Père Tanguy (cat. no. 33; fig. 3). Delaunay, the young pretender, modelled his portrait of Metzinger on these two celebrated paintings. The Japanese print behind Metzinger is a clear allusion to Van Gogh's portraits, but more subtle references could also be there. Is the wallpaper behind the sitter based on a sunflower design and could the chair on which Metzinger sits possibly be of the type made famous by Van Gogh? Whilst set in a modernist tradition which owes much to both Fauvism and Van Gogh, Delaunay brings to this portrait a power and dynamism which are entirely his own. The picture is avant-garde in many technical ways: he uses a strong aerial perspective, places his sitter in an unusual position in the canvas, intentionally creates an unbalanced composition and even goes so far as to use an unusual, rather upright format of canvas. His control of volume is also startling: the contours of the sitter's face, the depth of the composition and the light effects are all achieved by the direction of his brushstrokes, the weight of his brushstrokes and, most significantly, the way in which he places contrasting colours next to one another. A few years later, when he began to speak publicly about his colour theories, he referred regularly to the way in which colours could be made to 'vibrate' by being placed alongside one another. The contrasting of colours in this way created a dynamic for painting which could bring it to life. This painting is a perfect example. It is extrordinary to think how far ahead Delaunay was of his contemporaries in terms of colour theory. The same year that he executed L'Homme à la Tulipe he also executed an early precursor of his Disque paintings which rely entirely on the juxtaposition of colours for their beauty. The relation between the present painting and Paysage au disque solaire (fig. 6) clearly illustrates how Delaunay's colourist abstractions and whole theory of Orphism emerged out of Fauvism.